I pulled out some of the old photo albums to show Mom while she's here. For the extended family reading my blog, there are some real gems here which I'm sure you haven't seen in a while. I shall call this series, "The Atrocious Eighties!" The hair! The fashion! The agony! But first, I will start a bit further back, where it all began, with a rare photo of the Harris family all together. 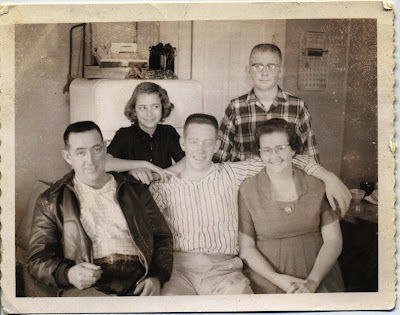 Here are Grandpa Milton Lewis, Aunt Pam, Uncle Dale, Dad, and Grandma Venita Inez, circa 1959. I look forward to seeing the pictures. This one should be labeled the "fifties" rather than the eighties though. I don't remember ever seeing this picture and it is really a great one. Especially Dad in his bomber jacket! Yes, that is a bitchin' cool jacket! i was home on a 10 day leave and on to fort leonard wood mo.